Monkey CoCo is a monthly box for kids age 5+ containing two STEM-based models to build. 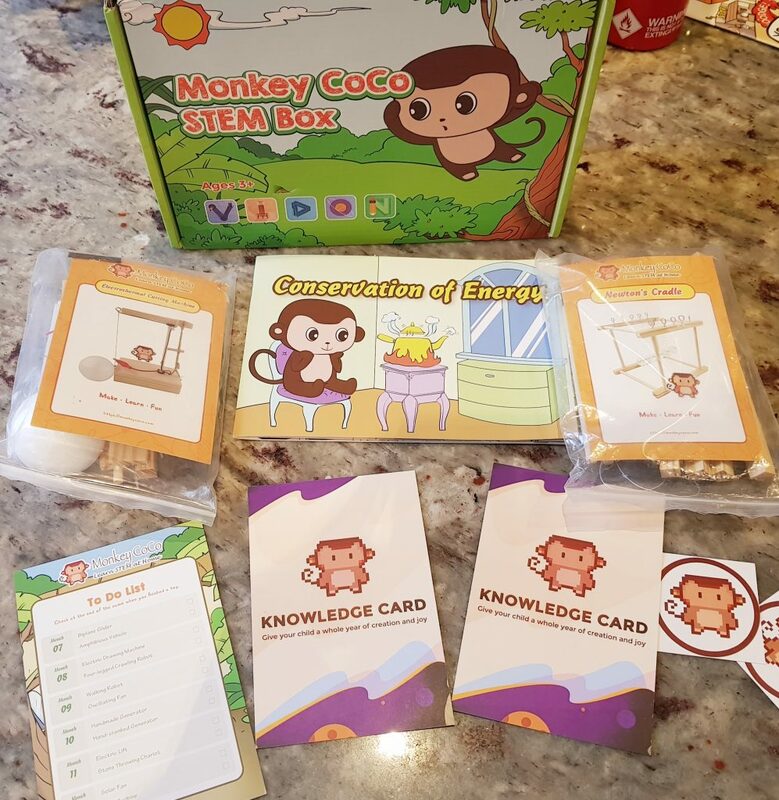 Also included are instructions, a brief guide to a scientific principle, and two knowledge cards. Note: These pictures were all taken as we went along. The bad lighting is thanks to overhead kitchen LED lights on a dark day! Helping me out was my daughter, who is eight. This is what’s inside the box. Each project is contained in a little bag, with all the bits and pieces you need. All the instructions are in the booklet, plus some information about the Conservation of Energy. 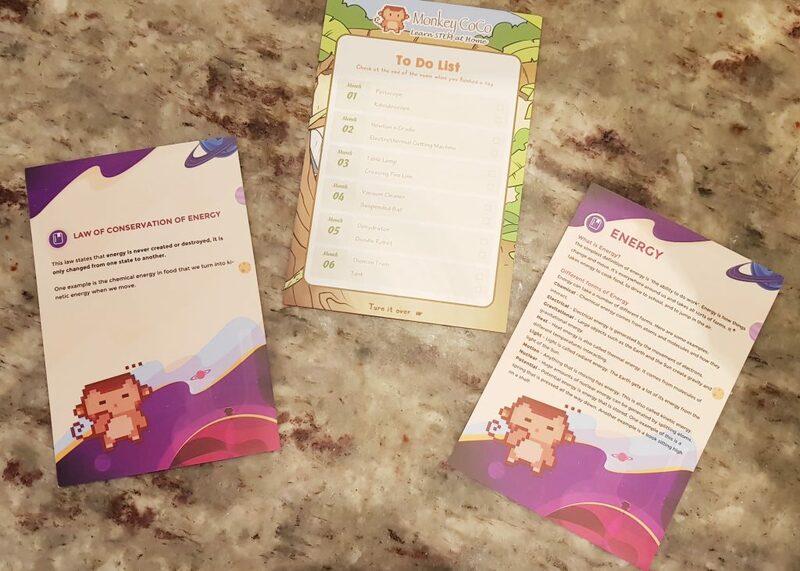 The Knowledge Cards give some basic information about the theme behind each box, in this case Energy. 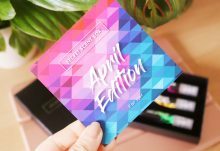 There’s also a little list showing you what will be in each monthly box. 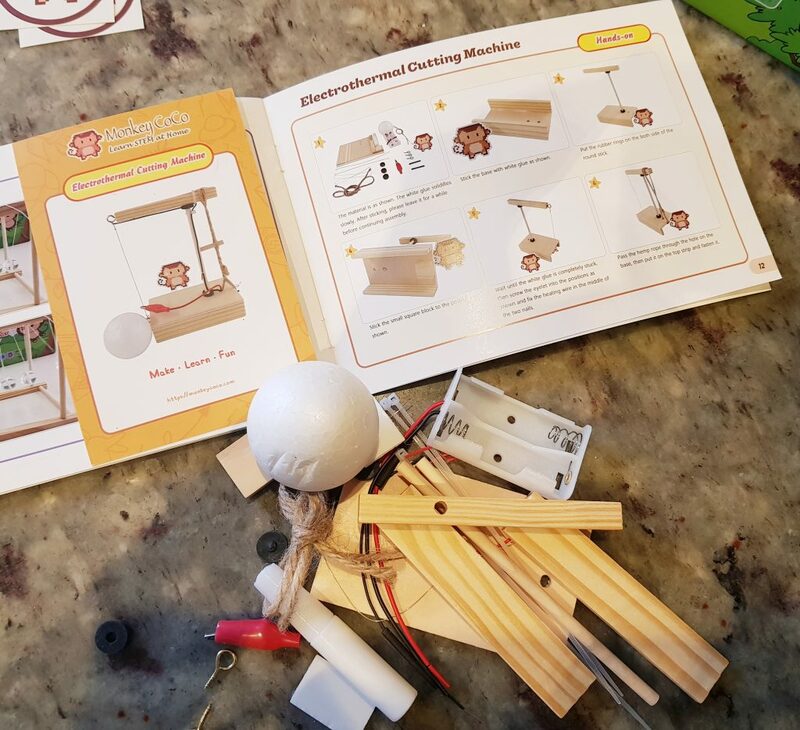 This month’s projects are to make an Electrothermal Cutting Machine and a Newton’s Cradle. 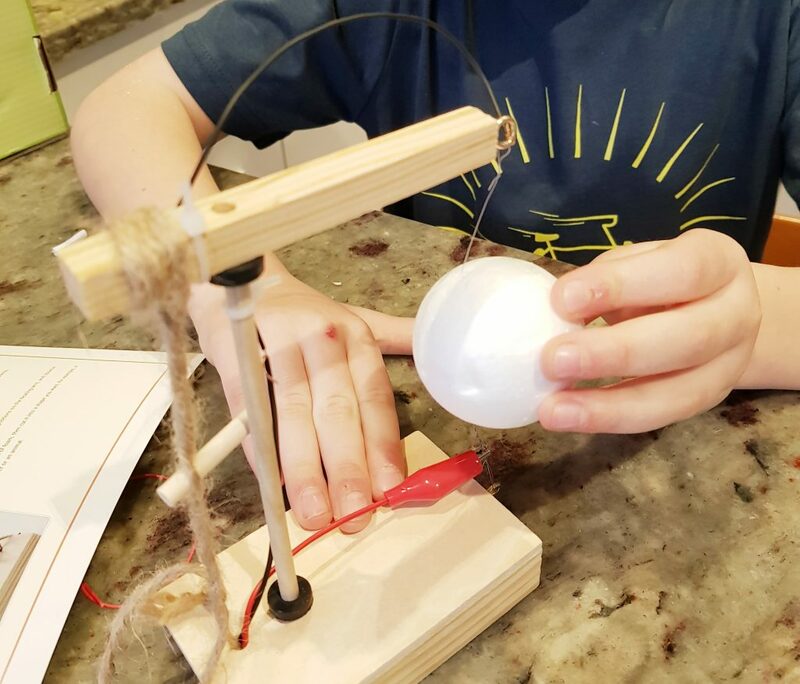 A Newton’s cradle is one of those executive toys with little balls that click back and forth. This project was the Elecrothermal Cutting Machine. There were lots of little bits and pieces contained in the bag. The instructions themselves were in the back of the booklet. There was glue included to put the wooden frame together, which my daughter could do herself. This project is battery operated, so we had to provide the batteries. Fortunately I had some spare! This machine worked by heating a wire via an electrical current, which could then be used to cut things. In the bag was a polystyrene sphere, which the wire cut beautifully. 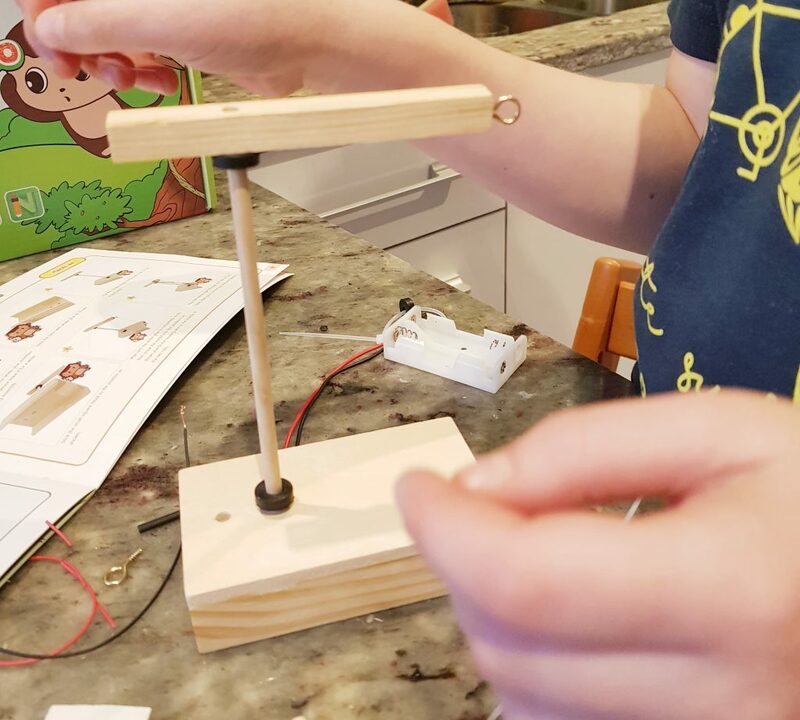 We also put together the Newton’s Cradle, which worked pretty well. I have a lot of thoughts about this box. The models themselves are wonderful. Designing a kit that makes real working models is extremely impressive. My daughter had a great deal of fun cutting up the polystyrene sphere, and was very pleased with how well it worked. The instructions were rather difficult to follow. Both the picture illustrations and the text were very small, some of the steps weren’t particularly well explained, and we both had to do some squinting and puzzling to figure out what was supposed to be done. The actual model building was tricky. I had to do the majority of the actual building, not least because quite a lot of it required strength that children don’t possess. Some of the things, like attaching (very thin) wires to a crocodile clip were extremely fiddly, and again, required a great deal of dexterity. I would say that I probably built 80% of the model itself. I think in principle there is a great deal to be learned from the projects in this box, but there isn’t any actual information on how they work or what they’re for. 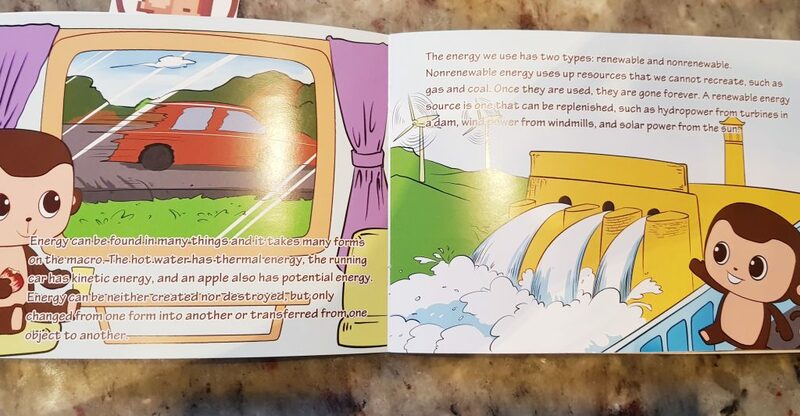 The illustrated booklet contains some general information about energy, as do the knowledge cards. However we both really wanted to know how the models worked and why. I was able to explain the Electrothermal Cutting machine, because I vaguely remember science classes. My daughter was also able to figure out what electrothermal meant, once I explained how to break down the word. The Newton’s Cradle was harder, as my knowledge started and ended with energy and momentum, and we ended up looking at Wikipedia to find out more about it. While my daughter knows about Newton, it would also have been very nice to have a little bit of information about him in there. My daughter enjoyed playing with the models very much, though she did feel rather left out of the building because there was so much she couldn’t do. She also didn’t like not being able to understand the instructions properly, unlike other science boxes she’s done. Even if children can’t do something themselves I think it’s important they understand what is happening, and if necessary, tell the adult what to do. She would have liked to have had clear information about how and why the models worked. She likes learning things, and while she enjoyed the results, she didn’t really feel like she had learned a great deal from it. Everything she actually learned was what I had told her and what we looked up. As a parent, I would have like to had a lot more guidance. I have enough basic knowledge to muddle through, and of course I have adult strength, dexterity, and experience. I could prompt conversation about the models and what they meant, because I’m educated and I know how to use Google. 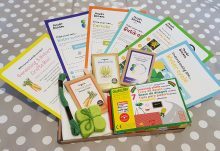 But not being a scientist or a teacher I would like to have the basics in front of me, with information presented in a child-friendly way. We both felt that this was not particularly child-friendly, and it is too reliant on adult input, both in the building and the learning. We both wanted more information directly related to the projects, as well as background, and we also wanted the instructions to be much clearer. Visually, the presentation could be improved, both in text and pictures. 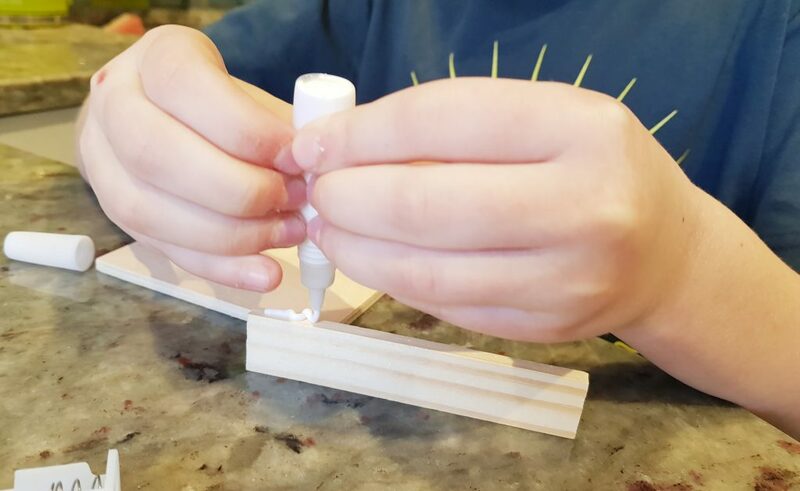 My daughter has done plenty of science-based projects and experiments, and has a pretty good sense of how things go together, but she really struggled here. This box is aimed at age 5 and up, but I think this is way too optimistic. An intelligent and capable 8 year old didn’t get the learning or hand-on experience she would have liked, and even I found some parts extremely tricky. There is a huge amount of potential in this, because the models are so beautifully done. I can see these have been ingeniously created, and there is so much that could be learned from them if the information was available and well presented. 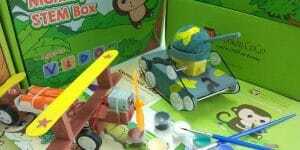 I think projects like this are a wonderful thing to do with your children, and my daughter and I enjoy many activities like this together. We work as partners, but she likes to feel like she is leading our project, and can do most things herself. If necessary she can and does ask for help, but for things like this she likes to take the lead. But in this, with a few exceptions, I was the one leading the project, which made it less about her learning and building and more about me making something. It was frustrating that while these are impressive models to enjoy here, the box didn't work as a cohesive activity. The models are terrific, but the instructions and learning materials need a complete rethink and redesign. If they get that part right, this could be something very special. How would you rate Monkey CoCo ?